Hello Quick Quotes friends! Marcia here to host the blog today. I have an autumn layout to share with you today that I made with the Quick Quotes Cherry Truffle collection. Squirrels for some reason like me to take their picture. I figure they must because they let me get real close. At this time of year they are always stuffing their faces too. I snapped this little guys photo on a recent trip to Itasca State Park in the Minnesota north woods. I wanted to bring out the yellow a little more, so I distressed the edge of my photo and applied some Lemonade and Mango Mai Tai Powderpuff chalk ink. It frames the photo nicely. I did the same to the red paper. Here is a peek at the photo edge. You can also see that I used my Biscotti Powderpuff chalk ink on the edge of the vellum. 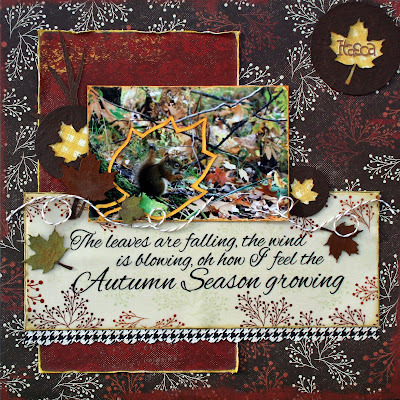 To embellish my layout, I used the Fall Leaves chipboard pieces. I wanted textured leaves, so I started by painting some gesso on my chipboard pieces. I applied more gesso in some places. After it was dry I painted the pieces with some brown acrylic paint. On the leaves, I then applied some Lemonade and Mango Mai Tai Powderpuff chalk ink. I love how they turned out, textured with muted colors. I hope you will give photo distressing a try, and remember to use those powderpuff inks to add some color. 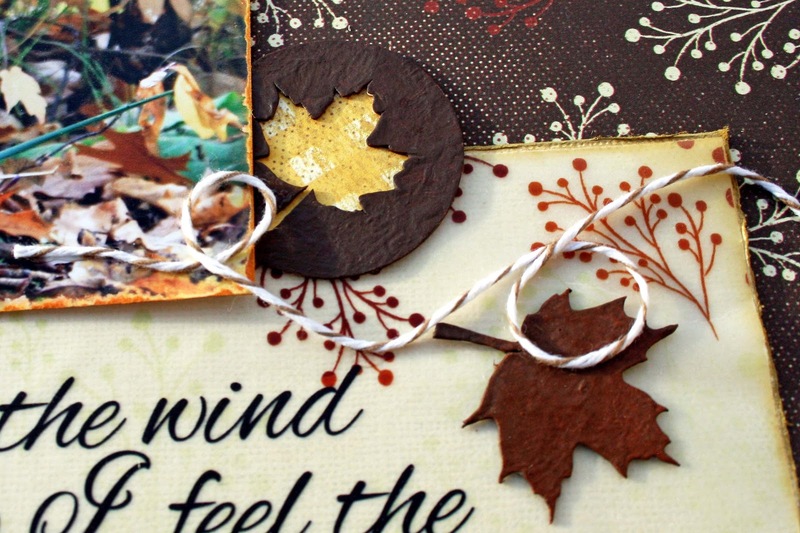 Cute Fall layout. 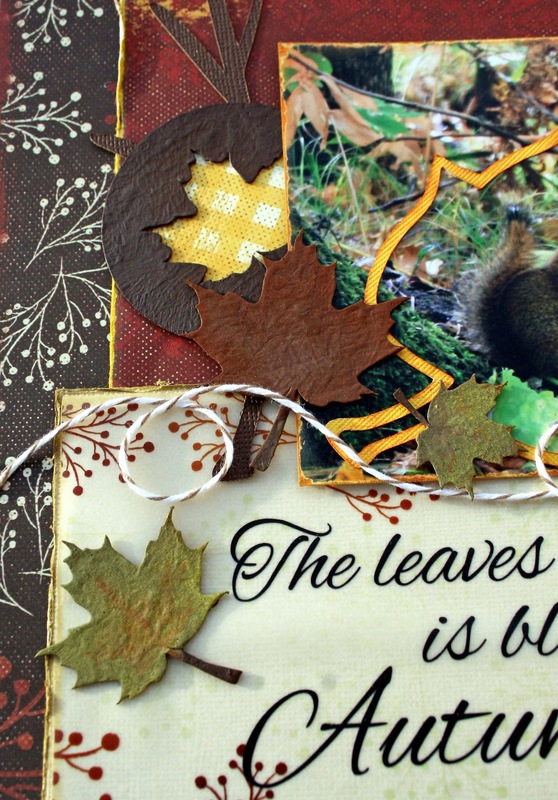 I like how you textured your chipboard leaves with gesso, and framed the squirel. I like the pop of yellow throughout the page. Very nice. Even though I do not like Squirrels, one died in between our Pink Panther in the attic above my walk-in closet, I like your wonderfully embellished Autumn scrapbook layout. This layout it beautiful! 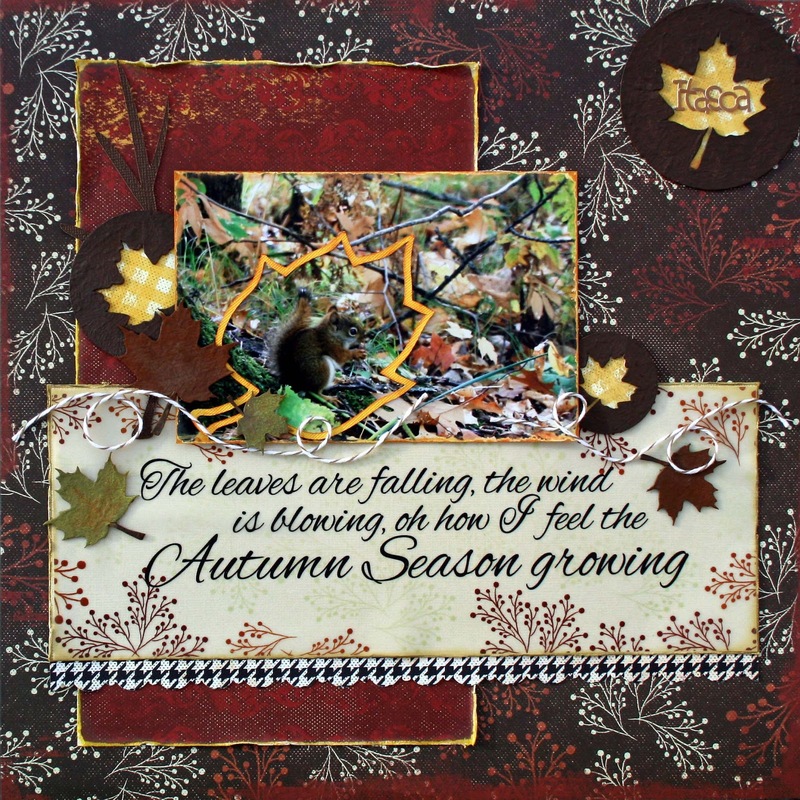 I love the way you colored and used the chipboard leaves and it was a brilliant idea to use the leaf outline around the squirrel! Great technique and so pretty!